Men and women with early Alzheimer’s disease may learn new skills from mental training exercises, a new study reports. The benefits may help them to recall important information and better go about their daily tasks, improvements that may ease the burden somewhat for caregivers, at least in the short-term. The research, published in the July/August issue of the American Journal of Geriatric Psychiatry, involved 44 men and women suffering from early Alzheimer’s. All were taking drugs such as Aricept that may provide limited benefits for some early in the course of the disease. Twenty-five of the study participants were given training, “cognitive rehabilitation,” consisting of two weekly 45-minute sessions for 12 weeks. During the training sessions, they were taught strategies for remembering names, such as connecting facial features with somebody’s name. A man named Sam who smiled a lot, for example, might be remembered as “smiling Sam.” They were also encouraged to keep memory journals where they could record such items as doctors’ appointments, the names and phone numbers of family members, and the time they took their medications, and to review their notebooks twice each day. Additional training taught ways to count change after making a purchase, how to use a calculator to balance a checkbook, and how to manipulate physical objects such as keys. Those with Alzheimer’s and their caregivers were encouraged to practice all these techniques at home. The remaining study participants received “mental stimulation” exercises, such as crossword puzzles and word games to do at home. They also played computer games and simulations that encouraged them to respond to visual challenges and were encouraged to speak about subjects such as where they grew up. On average, those who practiced the “cognitive rehabilitation” exercises showed a 170 percent improvement in their ability to recall names and faces compared with those who received the mental stimulation exercises. They also had a 71 percent improvement in their ability to provide proper change after a purchase. In addition, they responded better to their surroundings, were better oriented in terms of time and place, and could process information more rapidly. However, neither group showed any improvements in their ability to balance a checkbook or manipulate objects such as keys. These results are promising and may offer improved strategies for caring for those with dementia. However, not all persons with Alzheimer’s, even those in the early stage of the disease, may be able to engage in a mental exercise routine. If you try such exercises and the person with Alzheimer’s does not respond favorably, you should continue to be encouraging and not make him or her feel as if they have failed. Regardless of the apparent response, the activity and human contact are often beneficial for the person with Alzheimer’s. 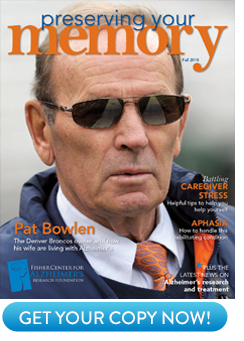 For more on the latest research on caregiving and Alzheimer’s disease, visit www.ALZinfo.org. David A. Lowenstein, Ph.D., et al: The American Journal of Geriatric Psychiatry. July-August 2004.